Our first topic in the multiplatform THINK! initiative was Guns in a Free Society. Our conversations did not focus on politics or Second Amendment issues. Instead, we explored productive ideas for living with guns in a free society. Our community partner is the League of Women Voters of Greater Pittsburgh. This historic organization is a dedicated proponent of strategies that will increase gun safety and reduce gun violence. Our second topic in our ongoing THINK! initiative was Equity and Opportunity. During our discussions, we examined the roles bias, fear and lack of understanding play in denying people personal and professional growth. How do these challenges impact the general population’s ability to advance and prosper? Poverty is a multifaceted social problem that affects billions of people worldwide. 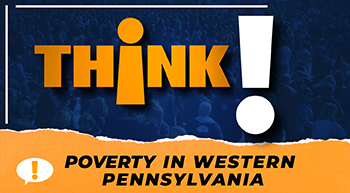 We focused our third initiative on Poverty in Western Pennsylvania - targeting specific issues such as removing the stigma of poverty, and creating coalitions to solve the systemic problem of poverty.